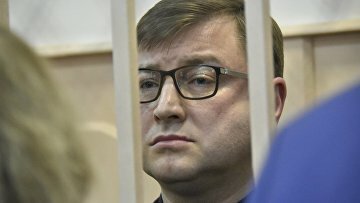 Detention of convicted businessman Mikhalchenko as part of new case upheld | Russian Legal Information Agency (RAPSI). MOSCOW, February 11 (RAPSI) – The Moscow City Court on Monday upheld a lower court’s ruling to hold CEO of Forum Holding Company Dmitry Mikhalchenko convicted of alcohol trafficking in detention until March 21 as part of a new case against him, RAPSI reports from the courtroom. The court thus refused to release the businessman from jail, in particular on a 50-million-ruble bail, as requested by defense. Mikhalchenko is suspected of organizing a criminal group and embezzlement. On December 28, the Basmanny District Court of Moscow found Mikhalchenko guilty of alcohol smuggling and sentenced him to 4 years and 7 months in prison. However, the term is to expire on April 19. Two other defendants in the alcohol smuggling case, Boris Korevsky and Alexey Mishchenko, were also convicted. Korevsky was given 5 years behind bars, Mishchenko received a 3-year suspended sentence. Mikhalchenko was arrested and detained in late March 2016. Investigators claimed that he had organized trafficking of alcoholic products from countries of the European Union. According to the prosecution, in 2015, the products were bought in European shops, collected in the port of Hamburg and then smuggled into Russia. The caused damage was estimated at more than 61 million rubles (about $1 million). Forum Holding Company established in 2011 is one of the largest multibusiness companies in Saint-Petersburg. The company has united several dozens of the city’s enterprises and organizations. Forum Holding consists of industrial enterprises, such as "Spinning Mill named after S.M. Kirov", the oldest textile industry enterprise in Russia, "Izmeron" factory, one of technological leaders of Russia’s downhole equipment market, according to the company’s website. 14:59 11/02/2019 The Moscow City Court on Monday upheld a lower court’s ruling to hold CEO of Forum Holding Company Dmitry Mikhalchenko convicted of alcohol trafficking in detention until March 21 as part of a new case against him.